Saturday, April 21: 10 a.m. until 6 p.m.
Sunday, April 22: 12 noon until 6 p.m.
701 Center for Contemporary Art (701 CCA), Columbia’s nonprofit visual arts and artist-in-residence center, presents 701 CCA Columbia Open Studios on April 21st and 22nd, 2012, now a partner of The Nickelodeon’s 6th Annual Indie Grits Festival. This free, self-led driving tour of 69 artists’ studios throughout Richland and Lexington Counties showcases the Midlands’ talented visual art community. Artists will open their studios and be on hand to share their personal stories, backgrounds and share their tools and techniques. Artists’ work will be available for purchase at zero markup. 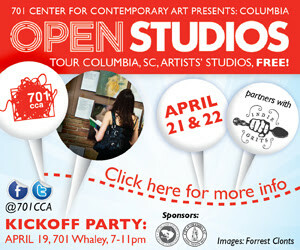 VisitColumbia Open Studios for more information on participating artists and to map out your Columbia Open Studios tour. ← Artista Vista 2012 – OH BROTHER! Where ART thou?